Have you ever had an idea for a software pop into your head, but leave just as quickly because you didn’t know how to make it? That’s unfortunate because creating software can be a really satisfying and profitable online business. It scales well, the barriers to entry are low and you don’t need to keep any stock like you would with a physical product. But if you’ve never built any software yourself before, the path can be a tough road to travel. The Software Secrets book and training is the first course I’ve seen that helps you create your own real software business. It’s full of actionable advice, and I highly recommend it if you’re interested in creating software. This is where Software Secrets comes in. Software Secrets is the latest product in the ClickFunnels ecosystem and is a full-blown book and training course that teaches you how to create software products. In this Software Secrets review, I’m going to deep dive into all the parts of this training system, and help you figure out whether the product is right for you. As I mentioned above, Software Secrets is a complete training system for learning how to create successful software products. More specifically, a software you can build an entire business around and charge recurring income for it. The main focus of the training is on building web-based similar to say ConvertKit or LeadPages. It was created by Garrett Pierson and Scott Brandley and is being marketed by Russell Brunson under the ClickFunnels product umbrella. 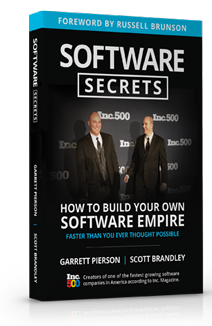 Both Garrett and Scott have run highly successful software businesses, and this course is basically their training where they share their process and experiences on creating software with you. As partners, they’ve created TrustGuard, CartRocket, RhinoSupport, and ShopperApproved among others. In 2016, ShopperApproved ranked #192 on the Inc 5000, growing 1938.91% to $2.7 million in revenue. Keep in mind that this is not a course for teaching you how to program. In fact, no programming knowledge is required at all. Instead, this course is all about how to come up with your own software idea, validate it, mock it up, and hire designers and developers to help you bring your software to life. And then lastly, how to market it so it can actually make money. If this sounds like something you want to do then read on. Otherwise, don’t bother reading the rest of this review as Software Secrets is not for you. The first is the Software Secrets book itself. This is the front-end product of the Software Secrets sales funnel. The full Software Secrets bundle consists of an online training Masterclass that supplements the book, access to a product called Software Funnels, and some other useful bonuses as well. You can actually order the physical book for $27 plus shipping and handling. However I purchased the full Software Secrets bundle directly, so I didn’t get a physical copy of the book. Instead, I got access to the PDF version of it. And if you are into audiobooks, you can listen to the audio version which is included as well. Probably the most important section of the book is the 2nd chapter which is about coming up with your software idea. Here you’ll learn the 7 Key Criteria for Software Success and how to come up with and validate your idea. If you can’t come up with an idea that you’re passionate about, then you don’t need to waste time with the rest of the book or course. Everything rests on coming up with a great idea. Once you have your idea, then it’s time to get your software built. This is where Garrett and Scott share their 12 steps to Building Successful Software. This is the meat of the book. As someone who has tried building and selling software in the past, I found this part to be extremely valuable. If you haven’t had experience creating software before, it would be easy to do these steps out of order. And that’s where a lot of software projects fail. I won’t give away everything in the book…but the key takeaway is. Design first and program last. The 12 steps are broken down into great detail. You’ll learn the importance of whiteboarding your ideas, create wireframes, and hire the right designers and programmers. Garrett and Scott include links to videos where they show examples of how they did certain things for their own software. A lot of these steps are explained in the context of using the Software Funnels software. However, the software is not required and there are both free and paid services that you can use to handle these steps yourself. Don’t expect this book to be a magic bullet. It’s not going to come up with a software idea for you. But if you have always wanted to create and sell your own software? Then this book is great. It’s not going to guarantee success. But it’s going to give you the guidance necessary to limit your mistakes, make the right hiring decisions, and take the proper steps to get a software built to launch. If this is you, then for $27, this book is a steal. If you want more hands-on training than the book provides, then you should consider the full Software Secrets Bundle. At $1997, it’s not cheap, but if you are serious about learning how to create your own software business, the investment is worth it. Inside here are 6 videos that go into more detail into the most important sections of the book. There are also bonus classes and a couple of case study interviews included as part of the Masterclass as well. Since they are so much longer, the videos cover a lot more than the book is able to. They also give you additional examples to follow and learn from to really reinforce each of the lessons. The bonus videos are pretty cool. This is where Garrett and Scott validate ideas submitted by other Software Secrets members. I found them helpful to get my mind working, and they helped inspire myself to come up with my own ideas. Software Funnels is the tool that was developed to help you build out your software. It consists of several different modules that will make the process easier, including whiteboarding, wireframing, team chat, and other project management features. You can invite your team members into the program and collaborate with them inside the software itself. When designing and creating Software Funnels, Garrett and Scott made sure to document every step of the process. So in this section, they give you an inside look at how they built the software using the exact steps outlined in the book. What’s unique here, is that these are live, unedited footage of the entire team going through each of the steps in the book. You’re literally a fly on the wall, getting a first-hand look at the entire process. It’s really great. If you needed even more examples, there’s also another live study you can follow as well. This time, Garrett and Scott using the same Software Secrets process to build out another one of their software products, ShopperApproved Local. It’s a different team than the Software Funnels case study, and you get to see how the process works on a different product which offers a nice perspective. Besides the video training mentioned above, there’s a ton of additional value inside the membership. First, you also get direct access to the same UI designers and developers that Garrett and Scott have been using themselves. If you’ve ever tried hiring before, you know that finding and vetting competent designers and programmers can be very challenging and time-consuming. So why not skip the hassle and go with someone that has proven to do good work before? Of course, you’re free to go on your own, and the included hiring templates are very useful for finding people on sites like Upwork, etc. You also get 6 months access to Software Funnels for free. It’s hard to put a value on the software since it’s not publicly released yet, but since this is the software all the included training refers to, it’s nice to have it in your toolbox. For some people, the Software Secrets book is enough to get started. Everything inside the Masterclass is based on the information contained in the book. If you’re someone that likes learning on your own and don’t need a lot of guidance then the book will work just fine. You don’t need Software Funnels either. All the features it provides like whiteboarding, wireframing, team chat, project management can all be handled by separate services. It’s just that they won’t be all integrated together in a single app, which is both good and bad. For those that want a little more hand-holding and examples, then the Masterclass will prove very helpful in your software creation journey. Yes, the price tag looks steep initially, but if you were to pay to attend a live 3-day workshop covering the same material, you would pay a lot more than that. Keep in mind, that getting your dream software built will cost quite a bit of money no matter what. But by going through this training, you’re learning through experts who have gone through the process before and will help you limit your mistakes. Affiliate Disclaimer: I hope you liked my Software Secrets review. Please note that some of the links inside this article may be affiliate links to Software Secrets. That means that if you click on one of the links and sign up, I may be compensated for it. If you do happen to click, we really appreciate it! Any money we make keeps this site running smoothly and allows us to keep writing these high-quality reviews. Yes, really nice case study. i had been following up cartrockets success since sometime and i guess i need to buy the book too to be more connected and to have that mindset. thanks for sharing. Save time with this Done-For-You Lead Magnet that will grow your list AND make affiliate sales.